The easiest style of all to install. Just peel off the protective paper, press it into place, and you're done. Q: Can the Double Draft Stop be cut to fit a smaller door or window? Yes. 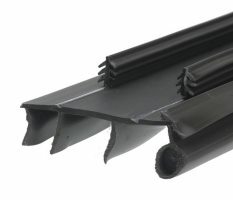 The foam tubes inside the Double Draft Stop can be cut to any size. Once the tubes are back in the case, the loose ends can be folded over to accommodate narrower doors and smaller windows. Q: Will The Double Draft Stop also keep bugs from crawling under the door? The Double Draft Stop is not rigid enough to prevent all bugs from crawling under the door. A better solution in this situation would be an Aluminum and Vinyl Door Sweep that attaches to the bottom inside of the door. 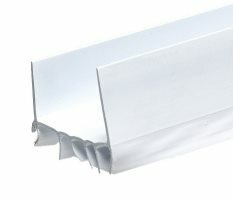 Q: What is the length of the fins on the PVC Door Bottom Replacement for Stanley Steel Doors? The fins on the 1 in. x 36 in. Brown PVC Door Bottom Replacement for Stanley Steel Doors will cover up to a 1/2" gap under the door. Q: How do I install my Door Sweep? Sweeps are fairly simple to install, take a look at the threshold video, or download the instructions. Q: Do Door Sweeps go on the inside or the outside of the door? 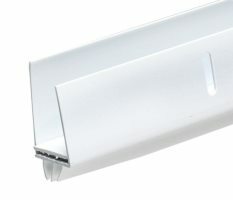 A majority of Door Sweeps should be installed on the inside of the door, since most entry doors are "in-swinging" doors. A door sweep attached to the outside of the door would be only be used for an "out-swinging" door. A good rule of thumb: you don't want the door sweep to cross the threshold when the door is in motion. Q: What size drill bit do I use on door sweeps? Use 1/8 inch drill bits. Q: What can I do to make sure the Vinyl Inset Fits Correctly? First, soak the Vinyl Insert in a tub of warm (but not hot) water, with just a drop of liquid soap, for about 10-15 minutes. This will make the Vinyl Insert more pliable and easier to work into the threshold grooves. Once the Insert is warmed up, it should be pliable enough to slide into the threshold groove with no problem. If the insert is just being stubborn, a plastic putty knife or plastic spatula can help guide the insert into the grooves for a snug fit. Q: How do I install my new Threshold. It's Easy. Take a look at the instructions here... threshold label instruction Or you can watch the Handy Guys install a new Threshold, here. Q: Does the 1 in. x 7 ft. Vinyl Clad Foam Kerf Door Seal install on the jamb or the door itself? 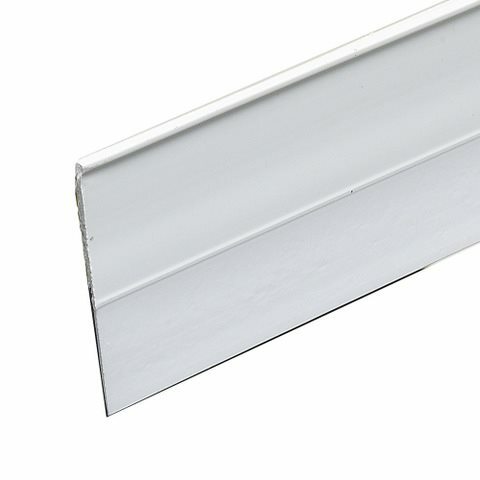 The Replacement Door Seal for Kerfed Mill Doors, is a replacement for the Kerf seal that should already be in the door jamb or if it is missing there should be a kerf cut into the existing door jamb to accept this product. 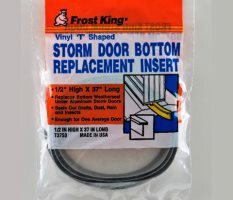 Made to replace the weatherseal under aluminum storm doors. The Adjustable Door Bottom is a unique two-piece construction. U-shaped Door Bottoms slide easily.